The Animazing skirt is so versatile. It can be transformed into several different animals as well as different holiday versions. Since it is the season for thinking about fall and Halloween, I transformed the Animazing skirt into a fun scarecrow version. Today I will share with you how I went about making this skirt so that you can use your creative talents and make one too. First of all, for a basic scarecrow version only the standard Animazing skirt pattern is required. If you would like to add the tulle underskirt like mine, the cutting charts and instructions are included in the Animazing Halloween add-on pack. Cut out all of the pattern pieces as instructed in the pattern. If adding a tulle underskirt, cut the front and back main skirt pieces 2.5” shorter in length than instructed on the pattern. Cut a triangle shape out of a scrap piece of cardboard. The size of the triangle is up to you. This will be what you will use to create the zigzag hemline. Using a standard 8 ½” x 11” sheet of paper, trace an equal number of triangles along the edge of the paper and cut them out. This paper will now be your template for tracing the zigzags to the bottom of the skirt. Fold your skirt front piece in half. Lay the template along the folded edge with the tip of the ‘v’ at the faw edge of the fabric. Trace the template with disappearing fabric marker or chalk. Continue tracing until you get to the other edge of the fabric. Leave .5” space between the end of the ‘v’ and the edge of the skirt, as this will be your seam allowance. Repeat the tracing process with the back skirt pieces, only this time leave the .5” space on both sides of the fabric pieces. If all the pieces look good to you, cut along the lines you just traced. If doing the tulle underskirt, repeat the same steps. Note: tracing on tulle may be difficult, so you may choose to use the template to cut without tracing first. Assemble the skirt sides according to the pattern instructions. To achieve a frayed look to the skirt, sew a straight stitch ⅜” from the raw zig zag hemline. This will allow the skirt to fray some with wash and wear, but without fraying too much. To get the frayed look before washing, I just grabbed the fabric at the tip of the ‘v’ and gently pinched while pulling down. I am sure there are other ways of achieving this look, it is just what worked well for me and for my fabric choice. 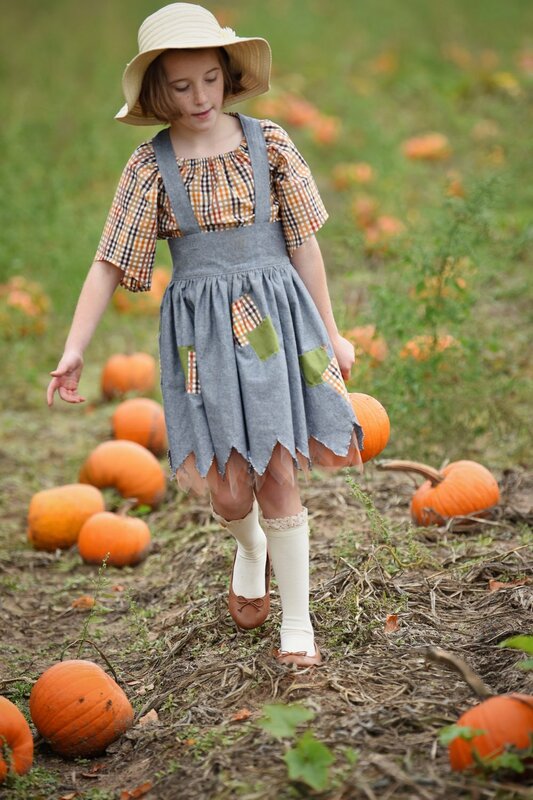 You may choose to add faux patches to your scarecrow skirt. The number, size, and positioning is completely up to you. When cutting your squares and/or rectangles leave the edges raw. You may even choose to slightly fray them before attaching. Lay out your skirt and position the patches wherever you choose. Pin in place. 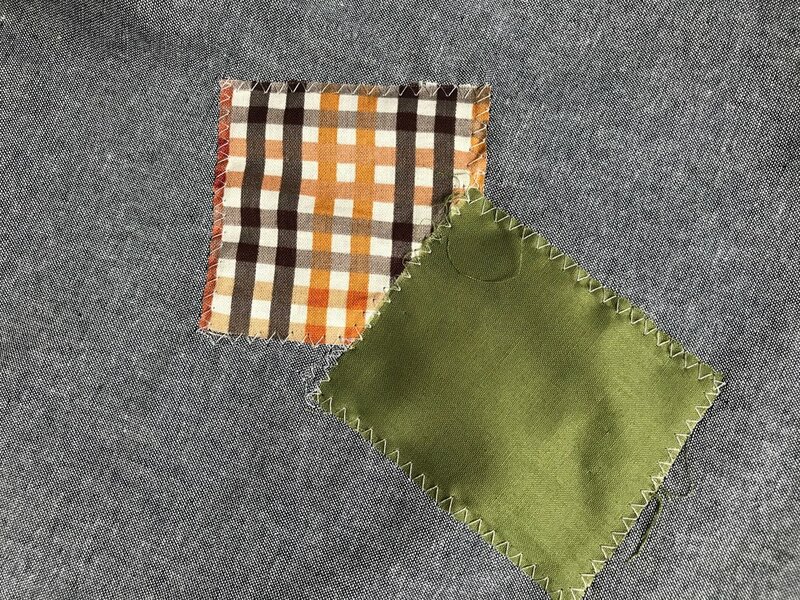 Sew around the patches to secure using a zigzag stitch. Optionally, you may choose to add some embroidery or other stitches to complete the look you are trying to achieve. After the hem is sewn and the embellishments added, finish your skirt according to the pattern instructions regarding gathering, attaching the waistband, and sewing the placket. If adding the tulle underskirt, be sure to follow the finishing instructions in the the Halloween add-on pack. Here is my completed scarecrow Animazing skirt paired with a Berkley top. With so many options available for Animazing Skirt, I hope you will sew up an one too! You can share pictures of what you create with Little Lizard King Patterns at Little Lizard King Sewing Pattern Group over on Facebook.